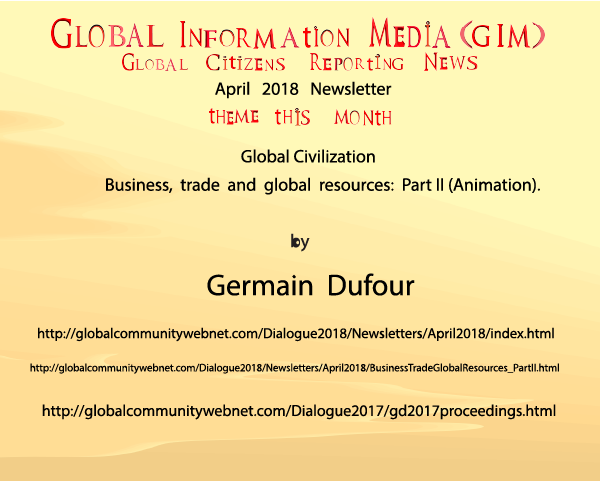 Global Civilization: business, trade and global resources: Part II (animation). 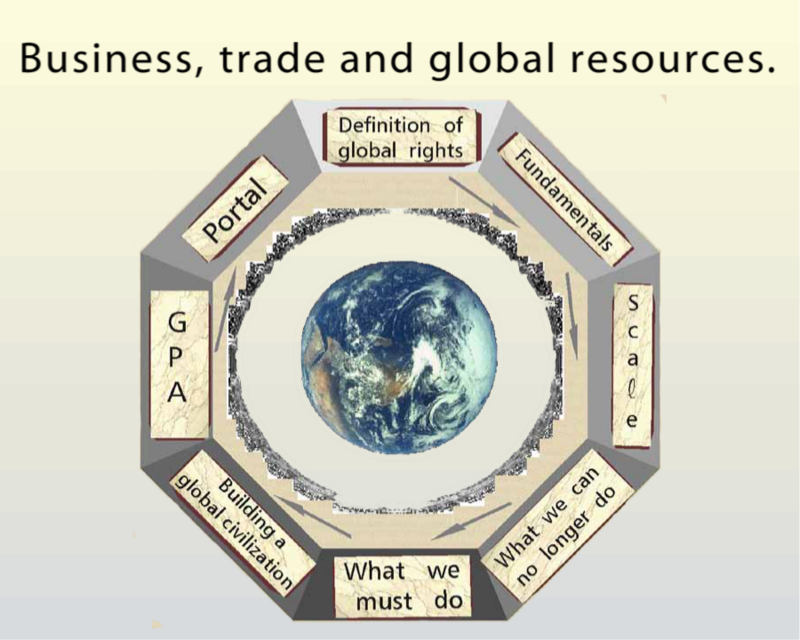 Business, trade and global resources: Part II (Animation). Related animations for the theme. 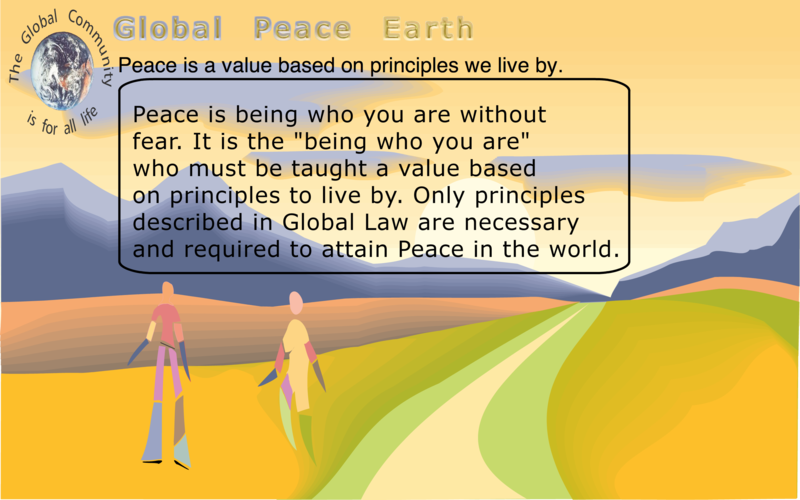 Global Peace Village-the way forward. 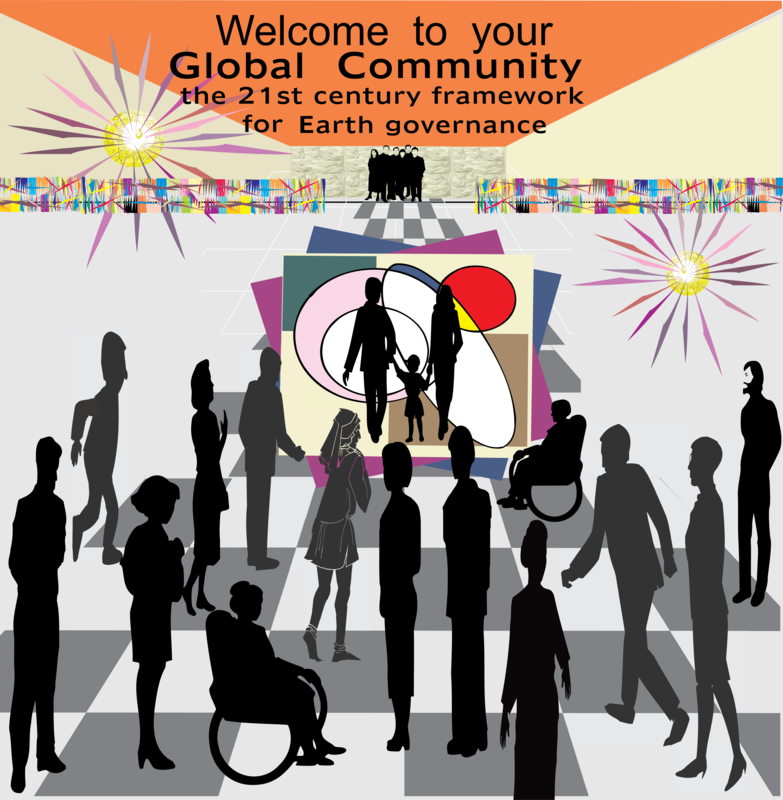 Global governance and Earth management; free trade; global ministries; global law, justice; Global Parliament. Complete definition and description of the Scale of Global Rights. Scale of Global Rights - title. This video is a tribute to cosmologist Stephen Hawking. Pictures of the main anaimation. 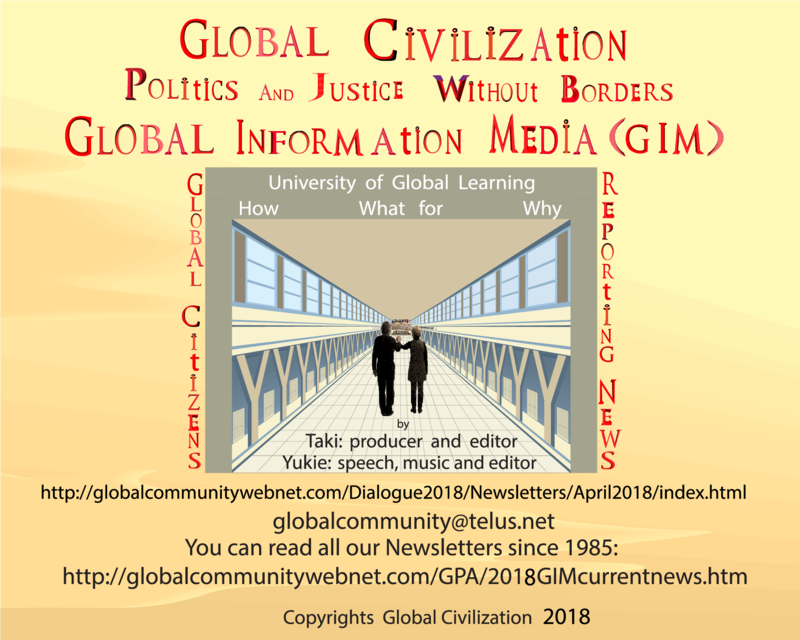 Global Dialogue 2018 theme: Global Civilization vision of Earth in 2024. 4. Images and text in the animations. Our world is populated with living beings consisting of millions of different life forms in different ecosystems interacting with each other to survive. The interaction and interdependence between land, water, the atmosphere, plants, and life forms are the driving force that creates and maintains an ecological, environmental equilibrium that has sustained life on Earth for millions of years enabling it to evolve, flourish and diversify. 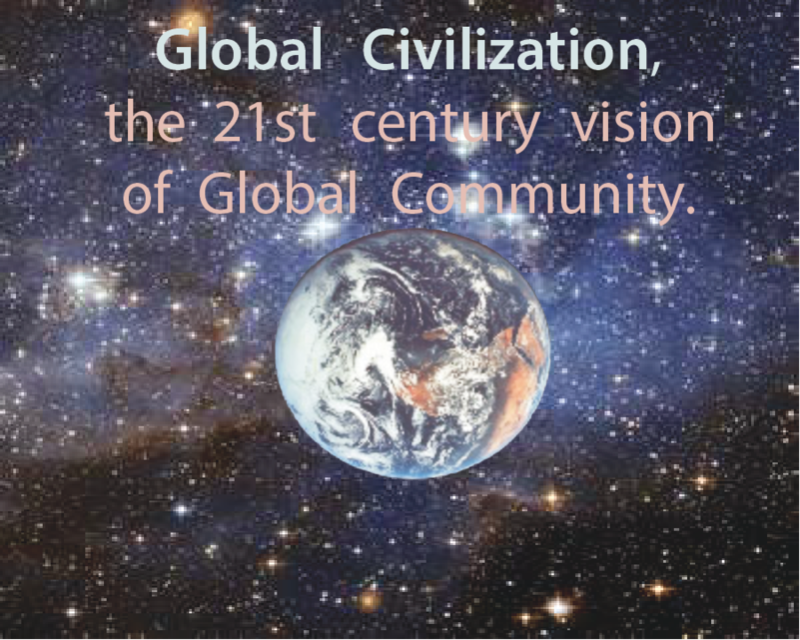 Global Civilization values Earth’s diversity in all its forms, the non-human as well as the human. 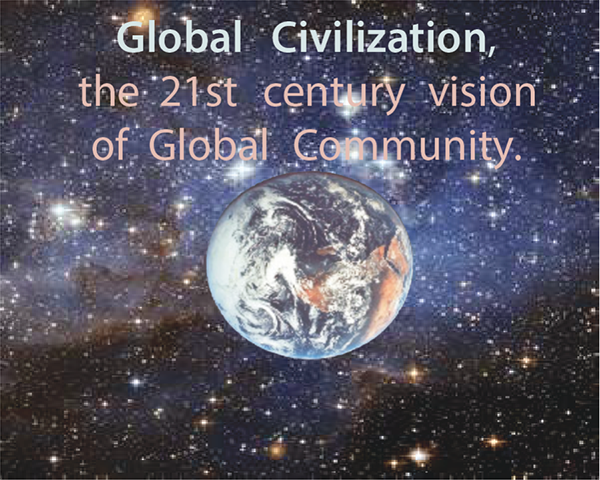 Global citizens truly want to protect this wonderful diversity of life that human activities are aimed to destroy. It's time for us to come to terms with reality. We need ways of organizing ourselves to help us live in a world with less energy and fewer material goods. We are exploiting our natural resources, minerals and fuels faster than we are gaining access to alternative sources. We are polluting the natural environment faster than the environment can regenerate itself to reach the level suitable for human needs. We are changing the global climate dangerously. Our attitude and way of life show a moral degradation toward the existing forms of life on the planet. It's time for us to protect what is left to protect: life itself on Earth. Our ways of doing business and trade are certainly the major areas to change in our lives. Let us have a quick look at trade. An international trade agreement usually involves an exchange of capital, goods and services from country to country, and represents a significant share of Gross Domestic Product (GDP). There is always a money flow: inflow and outflow. Trading globally gives consumers and countries the opportunity to be exposed to goods and services not available in their own countries. A multiple of products can be found on the international markets: food, clothes, oil and gas, wine, spare parts, jewelry, water, stocks, currencies, war industry products ...etc. Multiple services are also traded: banking, tourism, consulting, investments, travel, transportation services, a range of business and professional services referred to as commercial services, and government services...etc. The argument for 'free trade' insists on that countries should specialize in certain products that they are good at producing and buy from other countries what they are not good at producing, so that the economy is more efficient. What kind of efficiency is it, when the pieces of a product are sent half way around the world to be assembled in a country with cheap labour, then shipped back to be sold? It may be profitable to some businesses, but it is a waste of time and energy as well as resources, and moving products this way is not environmentally friendly and is a threat to the global life-support systems. What kind of efficiency is that? Huge amounts of money are spent on marketing to get people to buy things that they don't need. Where is the efficiency in that? Perceiving and understanding the human population in its role as a consumer is very important because consumers collectively spend two thirds of a country’s Gross Domestic Product (GDP). They buy and influence the purchase of an increasingly wide array of products. Despite the fact that we are making consumer decisions in an emerging Global Civilization, people are still being taught how to be "good consumers", when actually the word consume means, "to destroy, use or expend". The enormous productive capacities and market forces of the planet have been committed to satisfying human needs and desires with little overall regard to the short-term or long-term future of life on the planet, or life in other nations or in future generations. There are many different types of consumers, and they all need to be taken into account separately: teen, young adult, elderly, low income, disabled, illiterate, and ethnic. Each type of consumers need to be understood from the point of view of global sustainability; that is a global perspective that challenges materialism and promotes ecological responsibility, humanitarianism, well-being, consumer ethics and Global Civilization concepts. 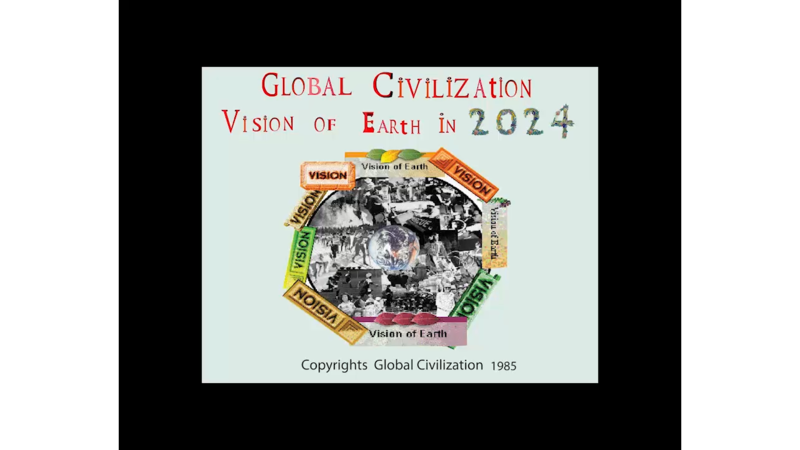 These concepts were developed to sustain Earth and they include world conditions, global problems and issues, global citizenship, stewardship of the ecosystem of the Earth, a moral and a spiritual community, universal values, and global interconnections. *	In line with human rights and responsibilities. Consumers' rights impinge on the rights of other people living in the world. The right to choice is the consumer right that refers to the right to have a range and variety of goods and services at competitive, fair prices and variable, satisfactory quality. In order to assure choice in the developed country markets, governments have implemented trade laws to facilitate cross border transactions and transnational corporations (TNCs) have set up business off shore so they can lessen the cost of the production process. The goods that are available in the developed country markets are provided by slave labour, child labour, sweatshops or in countries that allow the TNCs to forego adhering to pollution or ecological concerns and global rights in pursuit of profit. Labour rights are abused in efforts to earn more profits. This leads to abhorrent working conditions, job insecurity and low living standards (all global rights). Consumers in developed countries have been socialized to want more and more things to consume but have not been socialized to appreciate the impact of their consumption choices on the human rights of other people; that is, they are not being responsible for their decisions. * the impacts of a decision made by a family living in developed country to consume a particular good on the household subsistence, production and community activity of a family living in a developing country; and be aware if that decision would affect poverty, potable water, food diversity, arable land, security from war, education, communications. Consumers operate in an impersonal market economy where they make choices unburdened by guilt or social obligations; they just have to be able to pay. 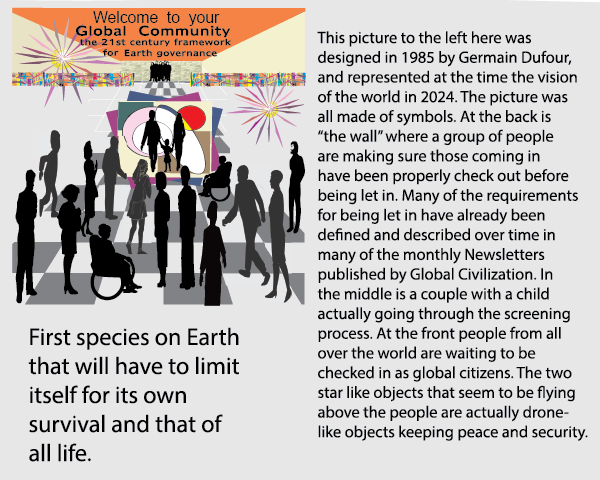 But a typical global community consumer see himself/herself as part of a larger whole that is affected by a collectivity of individual consumption decisions and has to question the global integrity of purchasing a product, and will decide not to purchase at all if the integrity is being challenged. Free trade encourages countries to change their economic infrastructures to be in line with the free trade policies of the World Trade Organization(WTO). Many member countries have already prioritised economic growth over social, environmental and human rights aspects. The WTO, foreign corporations and world business leaders claim that free trade brings sweeping democracy to all. 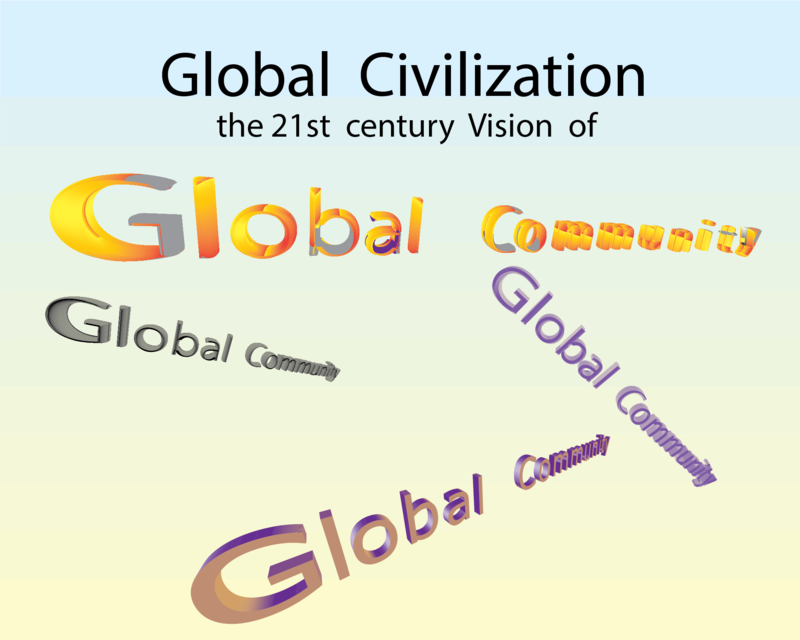 They claim trade globalization is a forerunner of democracy in nations where it is non-existent. Global Civilization does not believe that democracy will automatically succeed in a global free market. In fact, free trade is itself a flagrant abuse of democracy. 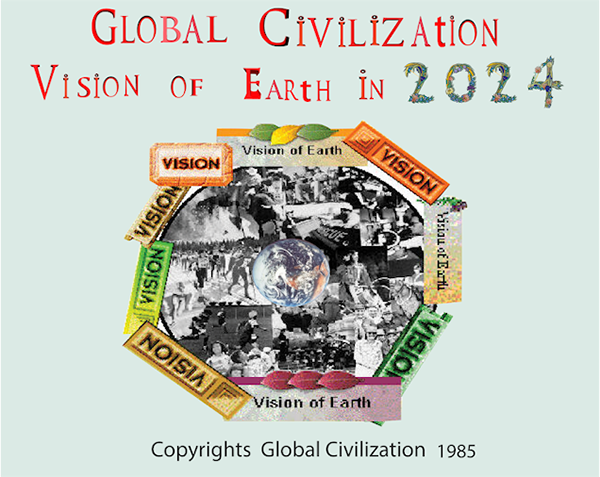 In the Vision of Earth in Year 2024, Global Civilization has shown that global energy consumption will rise by 60% due to population growth, urbanization, and economic and industrial expansion. To meet demand, conventional fuels and technologies will impact badly on an already degraded environment, public health and welfare, and global stability. World energy demand can be largely fulfilled by renewable energy technologies. There is however a strong opposition to change arising from the fossil fuel industry and from governments of most oil-producing nations and major fossil fuel users. There are significant advantages of shifting away from fossil fuels and nuclear energy and toward greater reliance on renewables. Decreasing the impacts of global warming is certainly the most significant advantage. Global carbon emissions must be reduced at least 70% over the next hundred years to stabilize atmospheric CO2 concentrations at 450 parts per million (ppm). 10. fossil fuels do not bring electricity in many developing countries but renewables can; no electricity means no access to education, clean water, improved health care, communications, and entertainment. f) incorporate all costs in the price of energy sources. Global consumption is a very important aspect of sustainable development. Consumers should be concerned with the impact of their decisions on the environment but also on the lives, human rights and well-being of other people. Since one of the key functions of families as a social institution is to engage in production (selling their labour in return for wages) and consumption (using those wages to buy goods and services), then the role of families has impacts on sustainable consumption and development.Just as corporations have social responsibilities and so do consumers in societies. Consumers are socialized to improve the quality of their lives. Note: We do not have any funds to pay anyone and for anything. We work strictly on a volunteer basis . 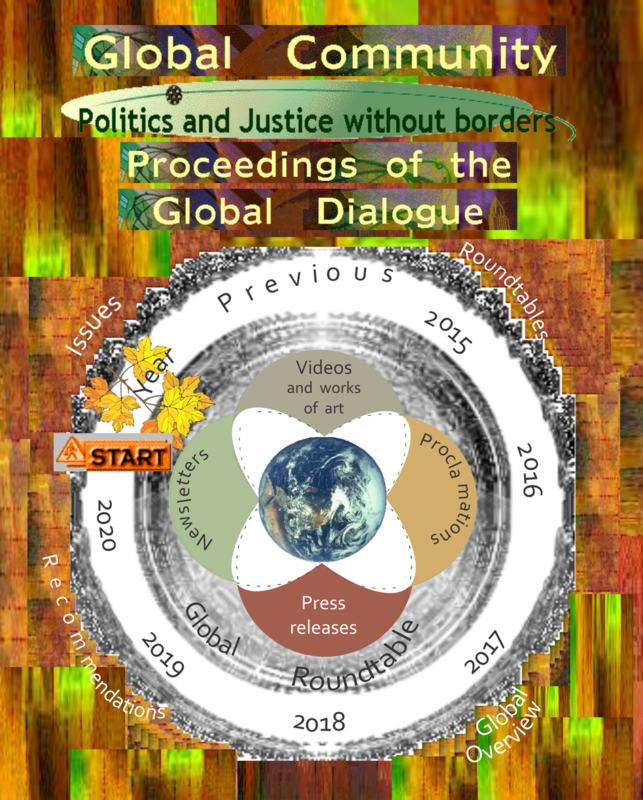 Global Dialogue 2017 Proceedings (September 1st 2016 to August 31st 2017). 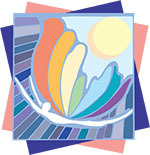 Global Community days of celebration or remembering throughout the year. Authors of research papers and articles on global issues for this month. Proceedings of Global Dialogue 2017. 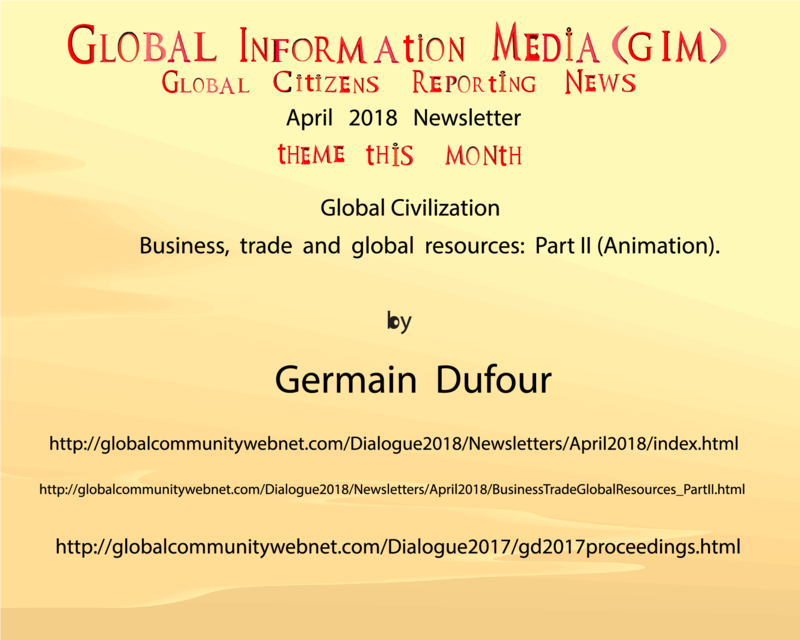 List of all author names in all papers, articles, comments, opinions, recommendations of Global Dialogue 2017. 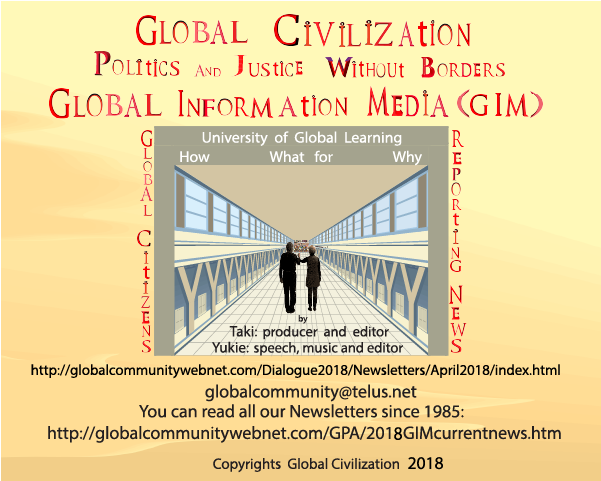 List of all author papers, articles, comments, opinions, recommendations of Global Dialogue 2017. Over the past decades we have shown that peace in the world and the survival and protection of all life on our planet go hand in hand. Asking for peace in the world means doing whatever is necessary to protect life on our planet. Protecting life implies bringing about the event of peace in the world. Let our time be a time remembered for a new respect for life, our determination to achieve sustainability, and our need for global justice and peace. Our Global Peace Mouvement is about the courage to live a life in a harmonious peace order and showing by example, thus preventing poverty, wars, terror and violence. We need to educate the coming generations with good principles, being compassionate, social harmony and global sustainability being some of them. John Scales Avery (2), Robert J Burrowes, Ruben Cantu, Julie Cappiello, Alan Davis, Dr Andrew Glikson, Ali Goodyear, Kevin Harun, Wenonah Hauter,Alex Jensen, Mark Karlin, Andrei Martyanov, Olivia Rosane, Dr Vivek Kumar Srivastava, Allen White. 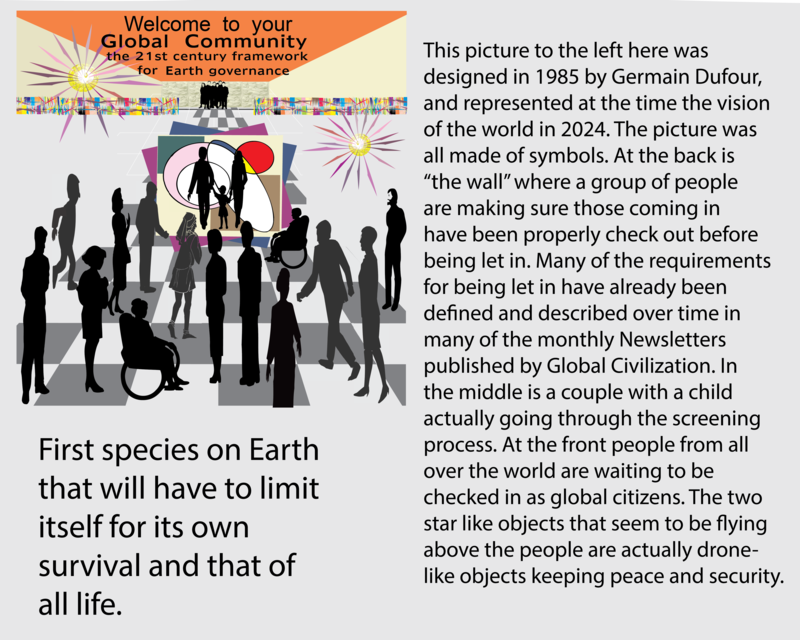 Robert J Burrowes, On Track for Extinction: Can Humanity Survive? Julie Cappiello, Humanity's Meat and Dairy Intake Must Be Cut in Half by 2050 to Avoid Dangerous Climate Change. Alan Davis, How Valuable Are Green Spaces to Our Cities? Wenonah Hauter, We Are Drowning in Plastic, and Fracking Companies Are Profiting. Olivia Rosane, If One Appointee Gets His Way, UN Could Recognize Healthy Environment as Human Right. Allen White, The Western Notion of Development Is Destroying the Planet: So What Are the Alternatives?